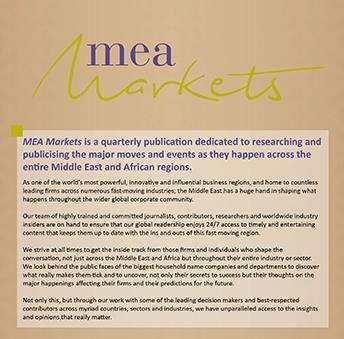 MEA Markets is a quarterly publication dedicated to researching and publicising the major moves and events as they happen across the entire Middle East & Africa region. As one of the world's most powerful, innovative and influential business regions, and home to countless leading firms across numerous fast-moving industries, the Middle East & Africa has a huge hand in shaping what happens throughout the wider global corporate community. Our team of highly trained and committed journalists, contributors, researchers and worldwide industry insiders are on hand to ensure that our global readership enjoys 24/7 access to timely and entertaining content that keeps them up to date with the ins and outs of this fast moving region. We strive at all times to get the inside track from those firms and individuals who shape the conversation, not just across the Middle East and Africa but throughout their entire industry or sector. We look behind the public faces of the biggest household name companies and departments to discover what really makes them tick and to uncover, not only their secrets to success but their thoughts on the major happenings affecting their firms and their predictions for the future. We can see the great success of our platform with over 87,500 page views in the last 12 months averaging at 7,200 page views per month we can see our magazine is loved by many. The unique users average at an incredible 2,300 per month and we can’t thank our readers enough for the amazing support they give us to bring this content to you. Not only this, but through our work with some of the leading decision makers and best-respected contributors across myriad countries, sectors and industries, we have unparalleled access to the insights and opinions that really matter.